Given the remarkable rate at which publications have been expanding to include several fields, including planetary and earth sciences, materials science, and instrumental analysis technology, the journal aims to encourage and develop a variety of such new interdisciplinary scientific fields, to encourage the wide scope of such new fields to bloom in the future, and to contribute to the rapidly growing international scientific community. To cope with this emerging scientific environment, in April 2000 the journal's two parent societies, MSJ* (The Mineralogical Society of Japan) and JAMPEG* (The Japanese Association of Mineralogists, Petrologists and Economic Geologists), combined their respective journals (the Mineralogical Journal and the Journal of Mineralogy, Petrology and Economic Geology). The result of this merger was the Journal of Mineralogical and Petrological Sciences, which has a greatly expanded and enriched scope compared to its predecessors. ＊MSJ and JAMPEG merged into one new society Japan Association of Mineralogical Sciences(JAMS) on September 22, 2007. 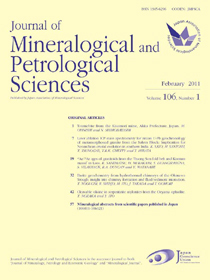 The Journal of Mineralogical and Petrological Sciences is indexed in the Institute for Scientific Information (ISI) database (Thomson Reuters), the Science Citation Index-Expanded, Current Contents/Physical, Chemical & Earth Sciences, and ISI Alerting Services. Issues from vol. 95 no. 4 (2000) are now available online. All future issues will be published online as well as in printed form. The editorial board is keen to encourage the submission of articles from researchers in a variety of scientific fields.